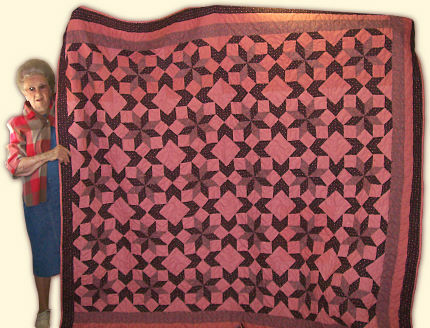 This queen size quilt was hand pieced during the course of a winter by veteran quilt maker Champion Esther Wrinkles. It was quilted by the talented machine quilter Faye Chaney who has since passed away. The quilt has been offered to the Skyline Area Volunteer Fire Department for it’s fund raiser which will occur the second week end in August, 2008. The quilt will be awarded in a drawing which will be held at the Skyline Picnic on August 9th. Tickets for an opportunity to win the quilt are available from any Skyline Volunteer Fire Department Ladies’ Auxiliary member. Scroll down to see a picture! Kim Kelley of Ozark, MO is the lucky winner of the 2008 Skyline Picnic Quilt. She purchased her ticket at the picnic on Friday evening and was delighted on Sunday to get the call from Esther Wrinkles that she had won the quilt. She said that she has been buying tickets from Esther for twenty years now and that it has been worth the investment. She has only missed one Skyline Picnic since they began over twenty years ago. Kelley attended Skyline School (Valedictorian 1979) and went on to Ava High School and graduated from Norwood High School. She has lived in Ozark for fourteen years where she works for AMPAC. While this is the first Picnic Quilt she has won, it is not the first of Esther’s quilts that she has. 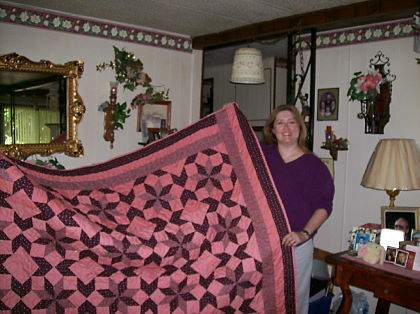 Over the years her husband has given her quilts that Esther has made as Christmas gifts. When she came to collect her prize on Saturday she did a little quilt shopping of her own. Her daughter Shandi Kelley is getting married in September and she has two younger daughters Dakotah and Myka as well. This year the Picnic Quilt earned a record $2,061.00 for the Skyline Volunteer Fire Department. Ms. Wrinkles sold $1,263.00 worth of tickets single handedly before the Picnic. She is one of the founding members of the Fire Department and has been a genuine asset to it from its beginning. She has been saying, however, that this will be the last time she goes out to sell quilt tickets. She is so grateful to all of those who have bought tickets from her over the years and would really like to thank them. “It is a shame that there can be only one winner,” she says and she fears that people will grow weary of buying tickets and not winning. Fire Department and Auxiliary members strongly disagree with her. The essential services provided to the rural communities by the Skyline Volunteer Fire Department are made possible by community support. Kim Kelley would certainly disagree as she fully expects to be buying quilt tickets from Esther again next year.